Stanley Kubrik tried to make a movie so violent that people would be sickened. People loved it. Needless to say, this was something of a shock, and I'm sure the movie was banned in places, but today it is mild in comparison to even an average action movie. The points about free-will, and maturity come through loud and clear - the violence does not stop that. And the film is typically Kubrik rich in look and feel.. I give this one a big thumbs up. 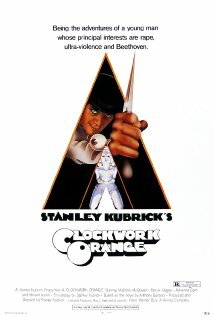 In a near-futuristic society, late teen Alex DeLarge is the leader of a gang of thugs - his "droogs" - who commit acts of ultra-violence, often with sexual components, without any regard for their victims, and purely because it strikes their collective fancies. These acts are largely fueled by drug use. In addition, Alex is a lover of music, especially that of Ludwig van Beethoven, which, when he listens to it during these acts, intensifies his pleasure, and in turn inspires him to commit further such acts. He does not tolerate any challenge to his leadership by his droogs. Although the authorities in general know of Alex's delinquency, they have so far been unable to catch him in the act of his crimes, until one night after a sexual assault of an older woman. Alex and Alex alone is charged, convicted and incarcerated. But Alex sees what he believes is an easy way out when the government looks for subjects to participate in a new rehabilitation therapy, the end result being release from prison after the two week therapy. The therapy ends up having consequences that Alex did not envision. The questions become how Alex will function, and how others will act toward him in his changed state.